Here it is: 2017. A year later. Now what? So nearly a year has gone by since my first BLOG entry. What is there to show for it? Last summer, there was a storytelling event in Tahlequah Oklahoma, capital of the Cherokee nation. This was hosted by the public library there, and I was honored to have a surprise guest arrive: Gayle Ross! She’s based in Tahlequah, but is an internationally respected Cherokee storyteller…. who just happened to drop everything that morning and come into town to hear my presentation at the public library. That brought back good memories from some nearly 30 years ago…. at the National Storytelling Festival in Jonesborough Tennessee….. when Gayle was part of a storytelling duo with Elizabeth Ellis….. and they were featured tellers at that national event. My husband Ed [who died of stomach cancer in 2014] and I were in charge of the sound in the Sisters’ Row Tent, one of the performance venues at the festival. And Ed was enthralled by those two. Well, so was I. Later, when the duo split up and went their solo storytelling ways, it was a shock to the system. But everyone got over that. And Gayle and Elizabeth have become strong solo artists, respecting each other and respecting their story-lore in their individual presentations. Earlier this year, I had made a point of attending the annual Tejas Storytelling Festival in Denton, especially to have a conversation with Elizabeth Ellis, who is considered the “matriarch” of Texas storytellers. I needed to have some counseling on where I go from here. Elizabeth is an excellent listener, and spent the time needed to allow me to talk my way through my issues. So both Elizabeth’s listening and Gayle’s making the effort to come support my work affirmed me in my chosen work as a storytelller. Both of these examples reminded me of another time, in 2006, when Ed and I were living in Pampa Texas. I was involved with the area arts council, Pampa Fine Arts Association, as well as the Pampa’s Tribute to Woody Guthrie. (Yes, Woody Guthrie lived in Pampa Texas in his late ‘teens and early ’20s, and his first wife was from Pampa.) Our local Woody Guthrie non-profit had purchased an old building near the railroad tracks, where Woody had worked—I use the term ”work” loosely—and discovered a guitar, which he taught himself to play. That was in the early 1930s. In the spring of 2005, folks around the Texas panhandle got to thinking about something called “Black Sunday.” On April 14, 1935, there was an immense dust storm which began somewhere in Nebraska and rolled down past Lubbock Texas. To remember this event 70 years earlier, I had compiled a full-length readers’ theatre production entitled THIS LAND, which included cuttings from letters, newspaper accounts and personal memories, as well as period gospel songs and Woody Guthrie selections—all used by permission—and we offered several public performances, with some 20 performers. Imagine my total astonishment at one of those performances when I walked out to welcome the audience….and saw two fellow storytellers, grinning like a couple of Cheshire cats. They were Tim Tingle, a noted Choctaw storyteller and author, and Doc Moore, a well-respected Anglo storyteller and winner of the prestigious John Henry Faulk award. They had driven up specially for this from central Texas! I’m not sure how they even found out about it! With that sort of encouragement, from not only these four colleagues, but also from my companions over the years with Southern Order of Storytellers, I felt not only professional support but real and deep friendship. Just this May, when I was driving from Oklahoma to Ontario for a month away from the weirdness of the political mess in the States, I experienced a bit of that support and friendship again. Because of flooding along several interstates as I drove across Missouri, many roads were either closed or had lengthy detours. It was difficult, for example, to find a way through St. Louis to get into Illinois. Finally, the weather report was such that I could go north to I-70, across the top of St. Louis and into Illinois. But I was on I-44, and it had problems in the Mississippi river area. Now all I had to do was get from Springfield MO to Columbia MO (where I could connect to I-70). And another storyteller friend provided with me with a short respite before continuing on into Illinois. Milbre Burch, who holds a PhD with an emphasis in storytelling and oral literature, has been a friend since 1988. With her husband, she lives in Columbia. And with good luck, she found my E-mail, said to come by while she was between classes at the university, and we could have an intense chat before she went back to campus and I continued on my way east. What a remarkable thing, to have that kind of friends! 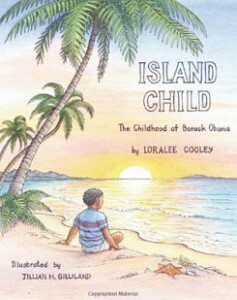 Click here to purchase your copy of "Island Child" The Childhood of Barack Obama on Amazon.com.